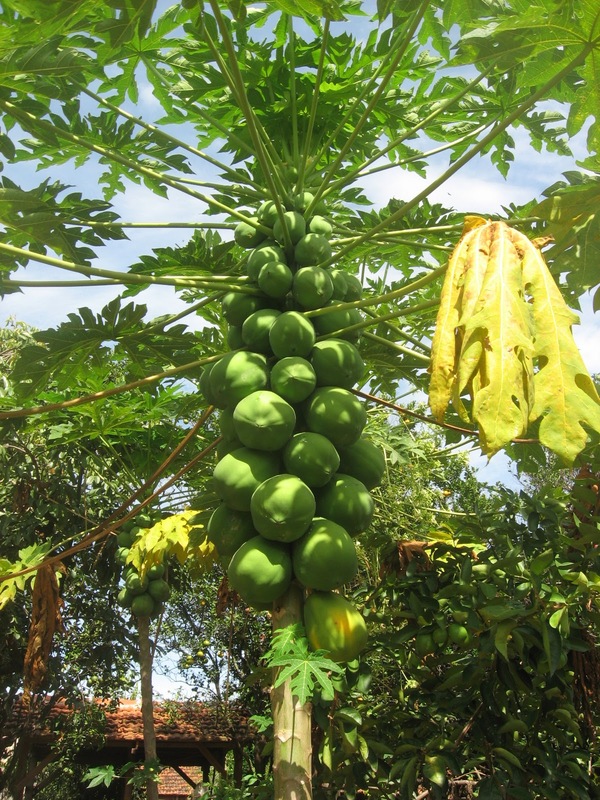 What should we do when we have soo many green papayas in a tree? Green Papaya Compote, of course! We don´t have real winters in most of Brazil, so no need to preserve seasonal fruits or vegetables - we have them all year round. When we do, it is because we want to eat it for our afternoon snack (we call it "afternoon coffee" - café da tarde). 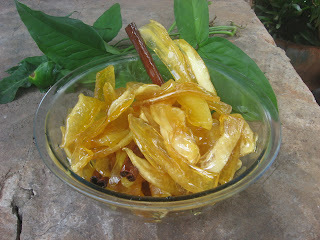 Green papaya compote is one of the most popular, as papaya trees can grow anywhere taking up little space. RECIPE: get a fully grown green papaya (not baby one, but before it starts to ripen) from the tree. Let it stand one night to draw out milky sap. Next day, peel it, cut it into pieces. Thicker pieces make creamier ones. Let the pieces soak overnight in water with one teaspoon of baking soda (for crispy outside and creamy inside). Add sugar (less than a kilo of sugar for a kilo of green papaya) and about 2 cups of water to make syrup. Cook all the ingredients together with cinnamon stick and cloves. Optional: add 2 fig leaves for aroma. This is a homemade recipe. You can have syrup in various degrees of thickness, color or sweetness.